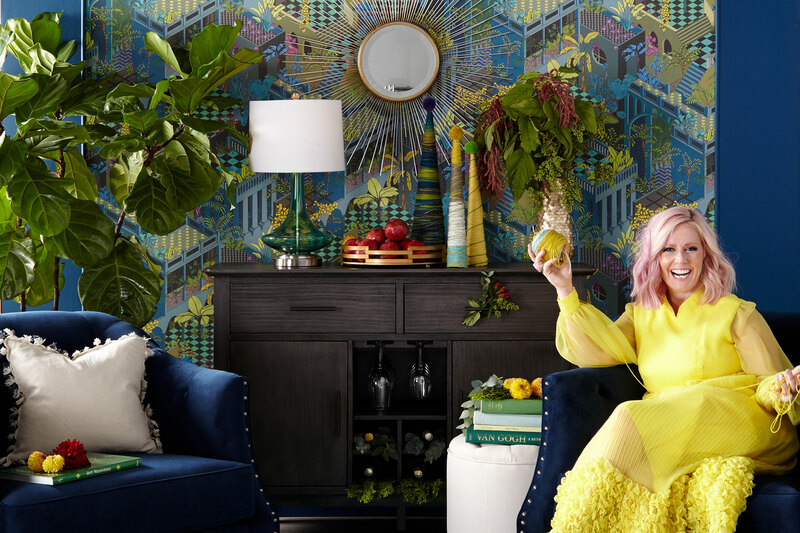 Home To Win designer Tiffany Pratt knows so much about colour. And she knows exactly how you should tie your holiday décor into your home decor. In fact she created this holiday yarn tree craft to match the room she created for Hello Yellow Holiday 2018. It’s a beautiful and simple way to be festive without forsaking your own personal sense of style in your home. Just choose yarn colours you already have in your décor scheme, and follow these steps. Cut cardstock into a triangle with a rounded base. Roll into a cone shape and secure with tape. Using a craft glue gun, add hot glue to cone tip and secure end of yarn at the top. Wrap yarn tightly around cone until you reach the base of your cone. Secure the end of your yarn at the base with another drop of hot glue. Be sloppy. Have fun. Layer on the yarn in various colours from your room. Attach pom-pom to cone tip with hot glue. And you’re done!